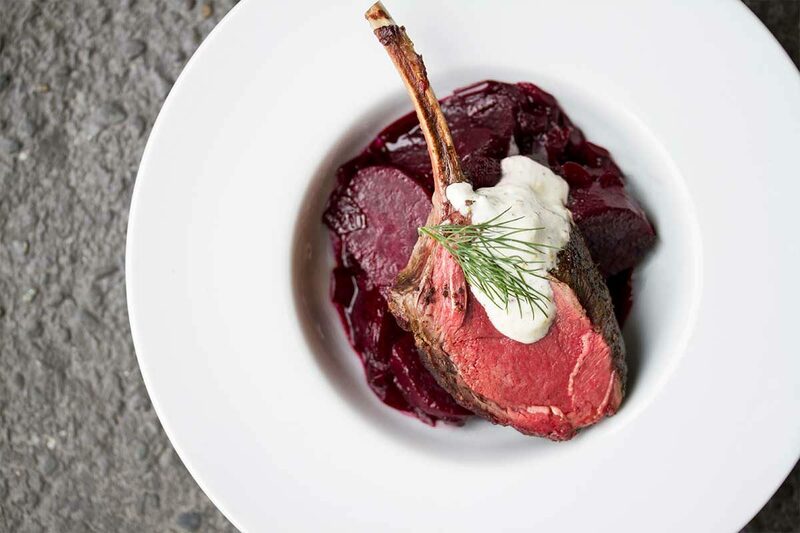 Elegant and beautiful, this dish pairs the rich flavors and red color of venison racks and braised beets with a creamy, spicy horseradish crème. Grind the juniper berries, rosemary, black pepper, and teaspoon of salt together in a clean coffee or spice grinder. Divide this spice blend in half. Heat 2 Tbsp of the oil in an oven-proof skillet over medium-high. Add the chopped onion, and saute until it’s soft and golden, then stir in the first half of the juniper-rosemary spice blend. Add the wine, the stock or water, two tbsp of the red wine vinegar, and the honey, and stir well. Add the beets, bring to a boil, cover the pan, and transfer it into the oven to cook for 40 minutes. At that time, remove the lid, give the beets a quick stir, and cook for an additional 20 minutes uncovered. Rub the remaining half of the spice mixture evenly over the venison rack. Set it aside at room temperature. To make the horseradish crème, simply mix the crème fraiche, Dijon mustard, and sugar in a small bowl. Add the horseradish bit by bit, to your taste. It should be quite sharp and punchy, though, to offset the sweetness of the beets and the meaty venison. When your beets are on their last 20 minutes of cooking, heat 1 Tbsp of oil in another ovenproof pan. When hot, sear the tenderloin on both sides, turning occasionally, until well browned. Put the pan into the oven and check after 7 minutes, temping it with a digital thermometer. Remove it from the oven as soon as it reaches an internal temperature of 130°F, tent it with foil, and let rest 6-8 minutes. Once the beets are tender, stir in the remaining 2 tbsp of red wine vinegar to brighten them up. To plate, spoon a stack of beets onto a plate or into a shallow bowl. 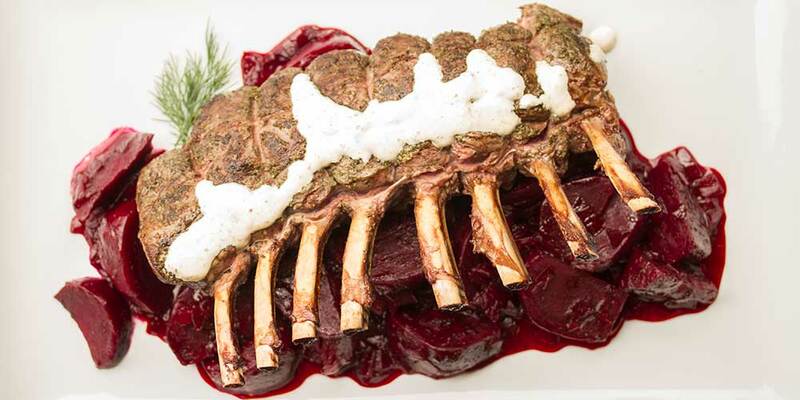 Slice the venison into chops, and serve 2 of them over each serving of beets. Top with a dollop of horseradish crème, and garnish (if desired) with fresh dill or rosemary.